Notification: 1st of July, 2011 - Because of the sudden shutdown of Full Tilt Poker, due to the suspension of their eGaming license, Titan Poker now offers an improved first deposit bonus of 200% up to $2,000 - an outstanding offer for high stakes players who are looking to switch rooms! Make sure to take advantage of this offer while it lasts, as this bonus is expected to drop back to $1,000 really soon! You can claim this improved bonus using our special Titan Poker coupon code EN2000MAX on your first deposit. Over the past years Titan Poker earned themselves a reputation that guarantees highest quality and reliability. A graphically polished and compact poker client as well as a customer support that has received many praises (and awards) for its service and efficiency play their part in why Titan Poker is one of the biggest and most popular poker rooms worldwide. Whether you want to play in big tournaments (up to $2.5 million prize money) or rather stay with lower limits, Titan Poker offers something for everyone, be it amateur or professional player. Titan Poker offers a new VIP programme called Club Titan that allows players to gather the same amount of points at the lower VIP levels in order to allow new players to level up faster. Now everyone will profit from playing a lot in the prior month as you will be rewarded with an additional VIP Level Point Boost depending on how much you played in the course of the month. If you earned anywhere from 250 - 999 Club Titan Points in a month, you will receive an additional 10% of your Points on top of that. You will be rewarded more for earning more points and for the ones among us who really play a lot that VIP Level Point Boost can reach up to 120% once you reach the VIP Diamond Level. These additional bonus points will be awarded to you at the end of the month automatically. No need to apply for anything. All in all it helps players level up faster and reaping better rewards. The VIP levels basically will allow you to make more use of the points you earned and give you a lot of loyalty based bonus offers and opportunities. You will be able to use your points purchasing things in the Titan Poker Store, use them as buy-ins or simply exchange them for cash. Keep in mind the more points you want to turn into cash at once the better the exchange rate. The Titan Poker client offers standard features such as the opportunity to attach personal notes to individual opponents, four colour decks, the option to maintain a buddy list, as well as hand histories that can be used for improving your game. In general terms they made sure to create poker software that is ease of use, and pretty much freely customisable. The advertised average amount of players of more than 15,000 pretty much ensures that you will find the game of your personal preference at any given time. However, with the current state of the online poker industry numerous of poker players are looking for a new shelter, and since many of them have already come to Titan Poker the number of 15,000 really is a tad fictitious. Larger amounts of players can be found playing at the Titan Poker's tables frequently, especially during the peak hours, and in the weekends. Titan Poker offers not only the highest first deposit bonus of all poker rooms on the iPoker Network, it also offers the easiest clearable bonus offer. The bonus offered to visitors of Max Poker Bonus is 200% up to $2,000. More information about this unique offer can be found on the Titan Poker bonus page we specially created to explain the details in depth. Even existing players are rewarded really well, besides Titan’s VIP programme, for their ongoing loyalty. At the moment of this writing, July of 2011, Titan Poker offers an incredible reload bonus of 100% up to $5,000. As far as I can remember there hasn’t been a better reload offer than current! 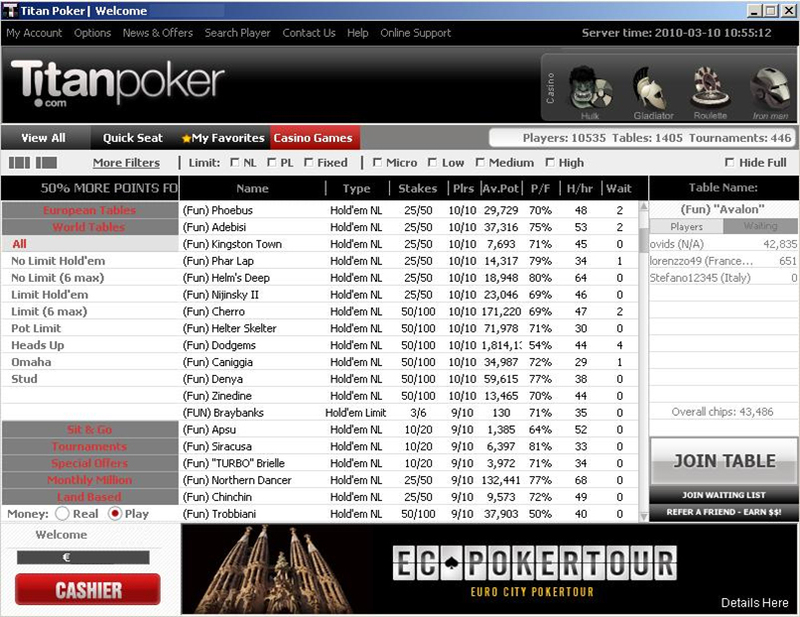 Being part of a respectable sized network such as the iPoker Network means a large variety in promotions offered. This is obviously a wonderful thing. There are plenty of ongoing promotion such as the Double Challenge, Top Hand of the Day, Bad Beat Bonus. Furthermore, Titan Poker, or better the iPoker Network, also offers periodically reoccurring promotions. The most famous, and definitely most interesting, is the European Championship of Online Poker (ECOOP) which is the equivalent to Full Tilt’s FTOPS, and PokerStars’ WCOOP. 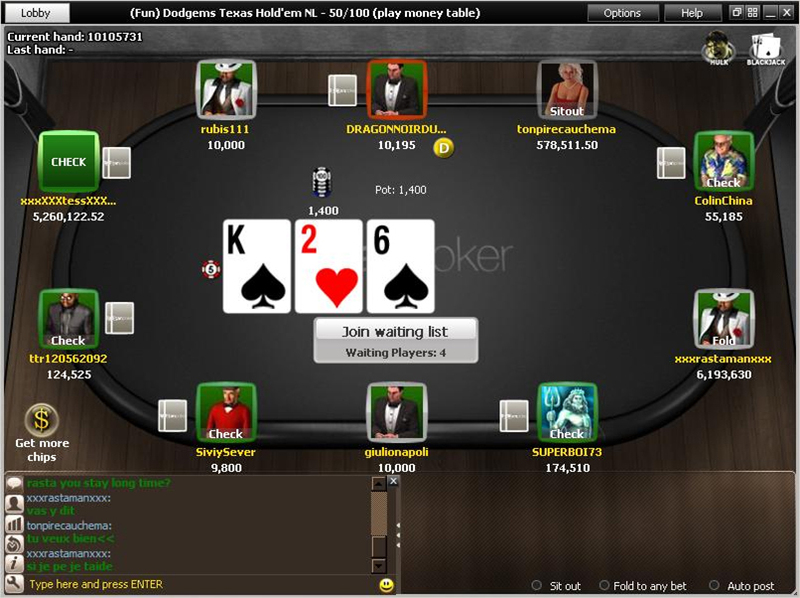 The iPoker Network, and so also Titan Poker, offer the most common and popular variants of the game of poker. First and foremost, most active players can be found playing Texas Hold’em. But other games such as Omaha, preferably Pot Limit Omaha, but also Omaha Hi/Lo, are very popular on the network. Less popular poker games, or at least online, are also to be found at Titan Poker: 5 Card Draw and 7 Card Stud. All these games are offered in the regular variations; limit, no limit, and fixed limit. All our reviews are short, including our Titan Poker Review & Bonus, but contain points which really matter. Any other information, such as security measures, jurisdictions e.d. can be found on the website of a online poker room itself. Even though the Titan Poker bonus we're offering is higher than average, it really doesn't matter whether you're going to choose ours, or use another site's Titan Poker bonus code when signing-up as a new player, you will surely enjoy playing at one of the largest poker rooms on the iPoker Network.